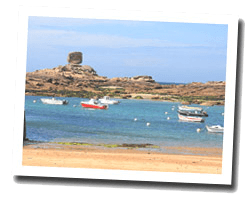 In Trégastel you can find beautiful landscapes along the rocky jagged coastline: pink granite rocks and picturesque islands. At the seaside you can find sandy beaches with various orientations. A marine aquarium is home to local or exotic species. The "Forum" is an aquatic center open all year-round, with a heated saltwater pool. In the countryside, you can discover megaliths. 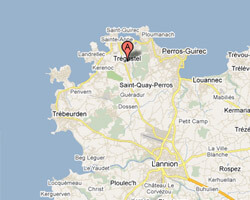 In Trégastel enjoy a seaview holiday rental. Price from 230 € to 800 €. 2 rooms apartment 50sq. m. Terrace with outdoor furniture. Close to beaches. 1 Bedroom(s), 0 double bed(s). short stays possibility. Final cleaning : 26 €. Apartment 2 rooms of 39m2 in the résidence \"les Bains\" facing the sea with view of the bay of Sainte Anne. Paid TV and WIFI. Shops at 100m. Direct access to the coastal path. Residence Les Bains is located in the seaside resort town of Trégastel, 8 kilometres from Perros Guirec and 10 kilometres from Lannion in the magnificent Granit Rose coast. Appartment Studio 24sqm. Residence Les Bains is located in the seaside resort town of Trégastel, 8 kilometres from Perros Guirec and 10 kilometres from Lannion in the magnificent Granit Rose coast. Appartent 1 bedroom 30sqm. 3 rooms apartment 78m2. Close to the beach. Pets allowed. 2 rooms apartment 42m2. Close to the beach. terrace. Pets allowed. Residence Les Bains is located in the seaside resort town of Trégastel, 8 kilometres from Perros Guirec and 10 kilometres from Lannion in the magnificent Granit Rose coast. Appartment 2 bedrooms 40sqm.